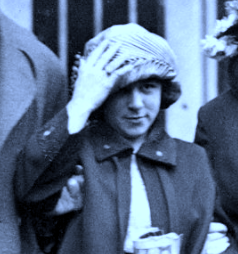 Like other working-class girls in 1920s Brooklyn, Celia Cooney had big dreams. Celia (at right and below) was a 20-year-old newlywed who toiled in a laundry. She and her husband, Ed, shared a furnished room on Madison Street in a neighborhood then called Bedford, today’s Bedford-Stuyvesant. Celia and Ed were very much in love. But like many young couples, they had a hard time saving money. Ed didn’t make much as a welder, and Celia enjoyed nice things, like the sealskin fur coat Ed bought for her. So when Celia found out she was pregnant, the Cooneys decided they needed to shore up their finances. How? By committing armed robbery. 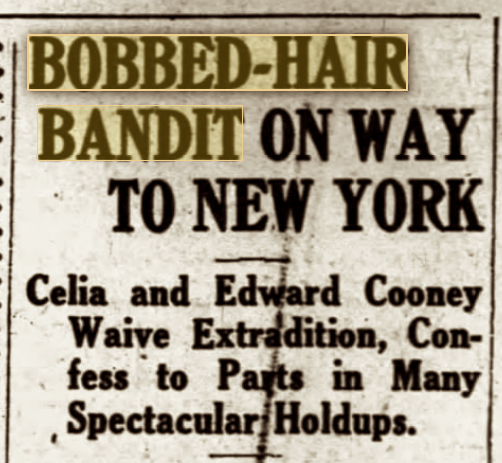 That’s the genesis of the “Bobbed-Haired Bandit,” as Celia was dubbed by the press. 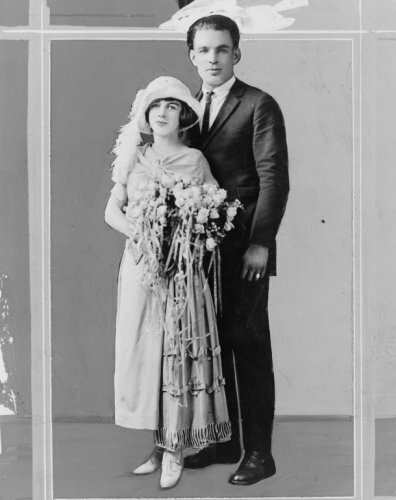 Together the couple (below, in their wedding photo) would stage holdups of Brooklyn groceries and drugstores and become Roaring Twenties tabloid icons. 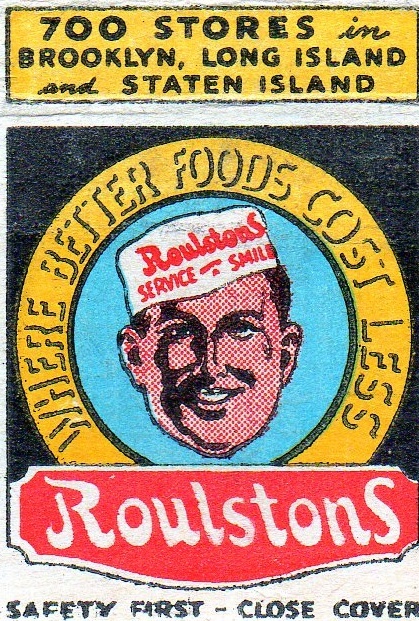 Their first robbery was at a Roulston’s, a grocery chain in Park Slope. On the evening of January 5, the two drove to the store on Seventh Avenue and Seventh Street. Wearing her fur coat, Celia went in first and asked for a dozen eggs, according to the 2005 book, The Bobbed-Hair Bandit, by Stephen Duncombe and Andrew Mattson. As the clerk readied her purchase, Ed entered the store. Celia pulled an automatic out of her pocket, pointed it at the clerk, and yelled, ‘Stick ’em up, quick!’ just as the bad guys in the detective stories and pulpy novels she devoured would say. Ed then whipped out a gun in each hand and cleaned out the cash register. The two took off with more than $600. After the first robbery, the couple immediately rented a two-story frame house at 1099 Pacific Street. They bought pricey furniture, and Celia made her husband a special dinner of porterhouse steak, states The Bobbed-Hair Bandit. But they quickly spent their loot…and had to commit more robberies to keep up their new higher-end lifestyle. 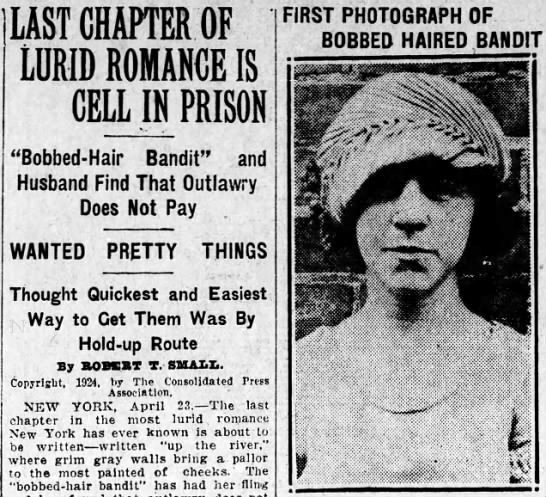 With so much tabloid exposure, the police were under pressure to capture the “girl robber.” That led cops to arrest and charge a 23-year-old bobbed-haired Brooklyn actress named Helen Quigley for the crimes. Angry that the police had arrested an innocent young woman, Celia left a note for them after she and Ed robbed a Clinton Hill drugstore. The note was addressed to the “dirty fish-peddling bums” and ordered them to let Helen Quigley go—which eventually the police did. 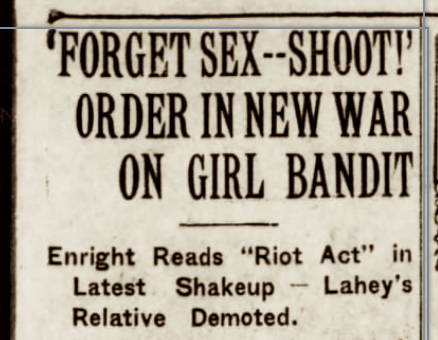 Celia and Ed’s stick-up spree finally ended in early spring, after a warehouse worker at the National Biscuit Company on Pacific Street was wounded during a holdup. By then, they had taken off for Florida, where Celia gave birth to her daughter on April 12, who sadly died days later. 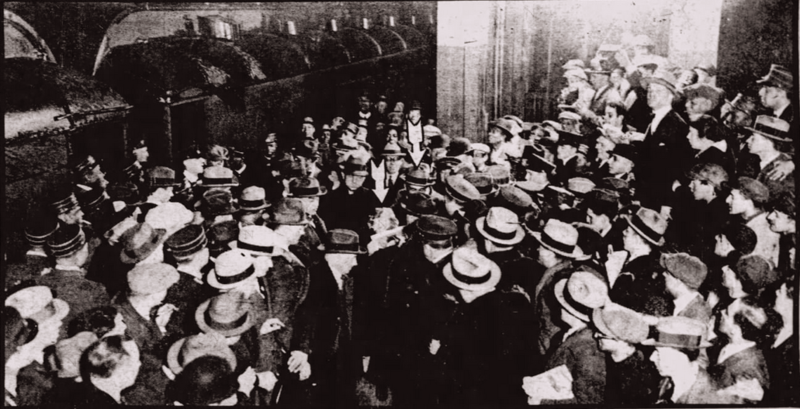 After the couple was arrested and brought back to New York (above, mobbed by crowds at Penn Station), they pleaded guilty and landed 10 to 20 years in prison. Ed died of tuberculosis in 1936. As for Celia, she reportedly was a “dutiful and selfless mother, working to support her boys, one of whom became a deacon in the Roman Catholic Church,” continued the Times. This entry was posted on February 11, 2019 at 4:40 am and is filed under Brooklyn, Disasters and crimes. You can follow any responses to this entry through the RSS 2.0 feed. You can leave a response, or trackback from your own site. Thanks, Ephemeral, very interesting. A very Bonnie & Clyde story. 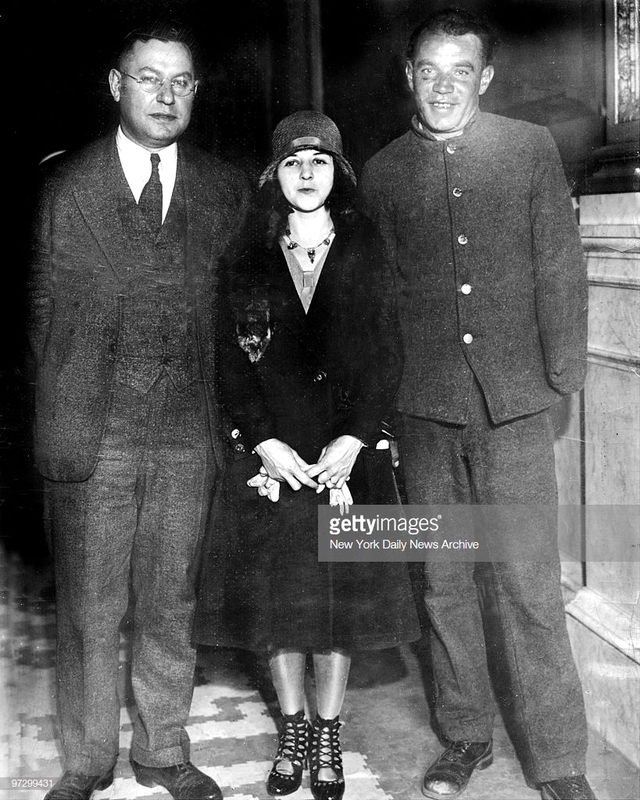 Were there other instances of male/female, husband/wife gangsters, does anyone know ? I have never understood the appeal and celebration of armed robbers especially the subset of criminal couples (Bonnie and Clyde,The Honeymoon Killers)). Is Ephemeral N.Y.wistful for this hideous behavior? Are you pininig for a reprise of this greedy and violent anti social behavior? In this era of identity politics and political correctness would a transgender bipolar couple of people of color terrorizing and shooting at working people and wounding innocent bystanders satisfy your voyeuristic perversion? Mike- How relaxed would you be if during a robbery you were on the floor blind folded ,hog-tied a knee in your back and a 45 jammed against the back of your skull. Instead of romanticizing violent gun wielding punks, have some empathy for the victms. ENY How about a little known N.Y.C. story about a couple of con artists who took off a bank or a Wall St. firm instead of a couple who violently preyed on their own kind. Like all posts on ENY, this one simply tells a little-known story from New York’s past…there’s no pining or agenda behind it. Sheesh, my grandfather was shot and killed in a hold up in 1991 and I don’t find this the least bit celebratory or offensive in any way. Do you know why? Because it happened 95 years ago. It’s history. Also, your snipes at trans and bipolar folks suggest you should have some empathy too. Great little story, I had never heard of this couple before. In the early 1960s me and my girlfriend stole from stores, mostly in Newark NJ, nothing big just small pocket items. It ended when I was nabbed pilfering a package of sandwich meat I stuffed in my pocket, looked mighty tasty at the time, and showed my career of being a stickup-man quickly came to a close….Anyway, nice story. Crime is part of history. In this case, the woman reformed and led an honest life after she was released from prison. Interesting story! What a story–and great illustrations. While they were certainly criminals, I’d hardly call them Bonnie and Clyde. I’d love to know more about her turn-around after prison. Is there a book about this? I’ve read some great books based on your blog. Thanks! Thanks so much–I have already requested it from my library. I learn so much from your blog. Glad to hear it! It’s a fascinating story I loved researching.